OS grid reference: NZ 9811 0188. The village of Ravenscar (a Viking place-name) is located on the east Yorkshire coast some 10 miles north of Scarborough, and 1 mile north of Staintondale. 700 feet above the seashore on the stepped, grassy headland stands the Raven Hall Country House Hotel on Raven Hall road. The building is said to have been built over, or on the site of, a Roman signal station and a fort or, more likely a fortlet? There is some uncertainty about this. The nearest recorded Roman fort is at Leaso Rigg, some 9 miles to the west. Also of interest near the Hotel is the Peak Alum Works, a site of great archaeological interest. The signal station here at Ravenscar was one of a chain of warning beacons that stretched along the Yorkshire coast from the Humber estuary to Teesdale. They were probably built in c370 AD at a time when the north of England was being invaded from Scotland by Pictish tribes, and from across the north sea by Saxons. These beacons could be fired-up at short notice to warn Roman garrisons further along the coast of impending raids by invaders from both land and sea. As was the case with the other signal stations, the one upon the headland above Ravenscar was built of stone and timber and would have had a large square-shaped tower with a beacon on top; a small courtyard would have run around the building, surrounded by high walls with look-out towers at angles along these walls and a ditch on the outside. A block-house for a small garrison of soldiers would have stood at the side or was attached to the signal station. Sometimes a fortlet was built along-side, which may have been what happened here. There is a rectangular earthwork in the garden of the hotel beside the cliff-edge – part of which at the extreme eastern-side has now gone over the edge. In the middle of this a square-shaped feature with low walls, recently excavated, would have been the beacon tower. This is probably all that now remains of the former signal station, the fortlet would have been where the hotel now stands. 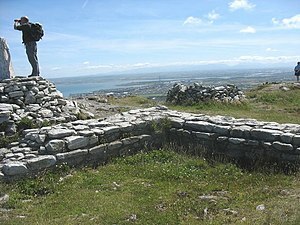 By about 405 AD the signal stations along the coast had been abandoned as Roman troops were recalled to Gaul, the people of Britain being left to look after themselves. In the 9th century the building was destroyed by Viking invaders. A piece of stone from the foundations of the signal station was unearthed in 1774 when the original Raven Hall was being built (the hotel is now built on the site of the hall). This is now on display in Whitby museum. A latin inscription on the flat rectangular stone recalls the building of the tower and fort from the ground by Justinianus, the praepositus (Governor of the province) and Vindicianus, the magister (Prefect). The Latin inscription in full is: IVSTINIANUSPP VINDICIANVS MASBIERIVRR MCASIRVMEFC ACO. de la Bedoyere, Guy., The Finds Of Roman Britain, Batsford, London, 1989. Mead, Harry., A Prospect Of The North York Moors, Hutton Press, Beverley, East Yorkshire, 2000. Categories: Ravenscar Roman Signal Station, Roman Sites | Tags: Ravenscar Roman Signal Station in East Yorkshire | Permalink.